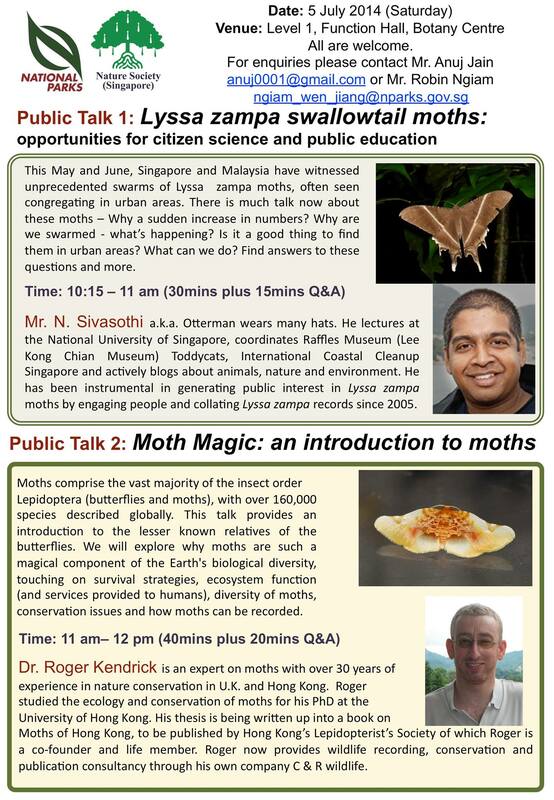 An upcoming symposium on citizen science at Yale-NUS College, 3-4 March 2017 which will feature a mixture of talks and workshops, with the goal of increasing understanding of citizen science both locally and internationally. Anticipated topics are the role of technology in citizen science, and bridging citizen science with pedagogy. All are invited to register to attend (free) at the registration page. Working with a team to resolve and propose solutions for chironomid challenges faced at the reservoirs . You will learn to identify the different nuisance and potential nuisance chironomid species (adults). You will also work on improving chironomid monitoring and monitoring methods in the reservoirs. Working with another division to provide advice on larvae monitoring, BTI dosing and fogging operations. Investigating and reviewing fish-kills issues at the reservoirs or waterways. Working closely with external parties on aquatic ecology and biodiversity related research projects in the reservoirs. Thereafter you will assist to implement the findings of the project on the ground. 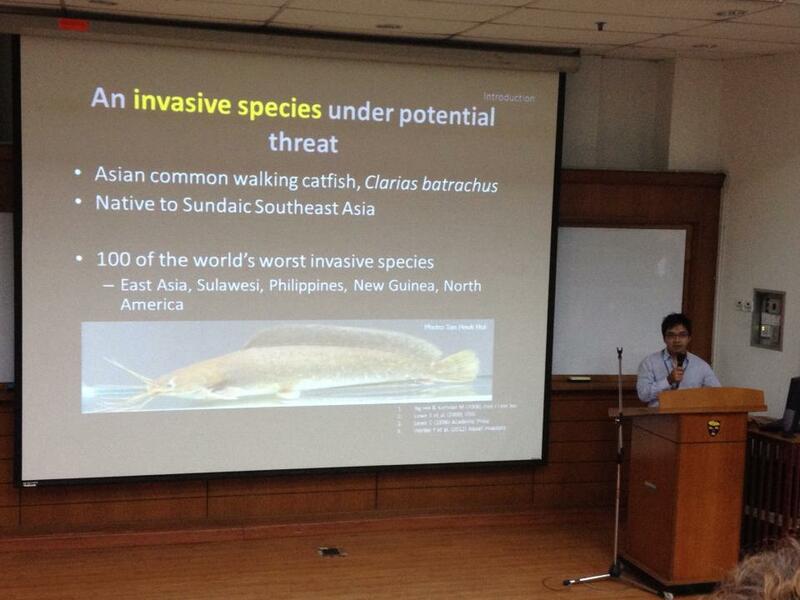 Congratulations to Toh Tai Chong and colleagues from the Reef Ecology Lab. 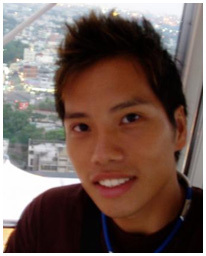 Tai Chong’s recent work on “Augmenting the Post-Transplantation Growth and Survivorship of Juvenile Scleractinian Corals via Nutritional Enhancement” has been published in PLOS ONE. The journal article has also been reported by Kayla Graham on the international scientific news website EurekAlert in “Feeding increases coral transplant survival“. The Biological Sciences Graduate Congress is an annual congress organized by three collaborating universities: National University of Singapore (NUS), Singapore, University of Malaya (UM), Malaysia, and Chulalongkorn University (CU), Thailand. In this congress, graduate students present their research work from four different themes – Functional Genomics and Structural Biology, Biochemistry, Physiology & Biotechnology, Cell and Molecular Biology, Biodiversity, Conservation & Ecology. 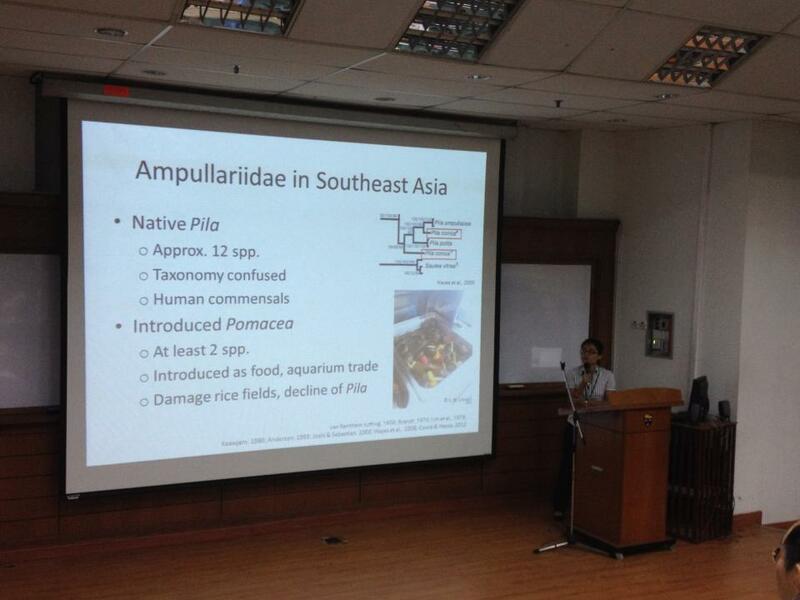 Ng Ting Hui presenting her work on apple snails. 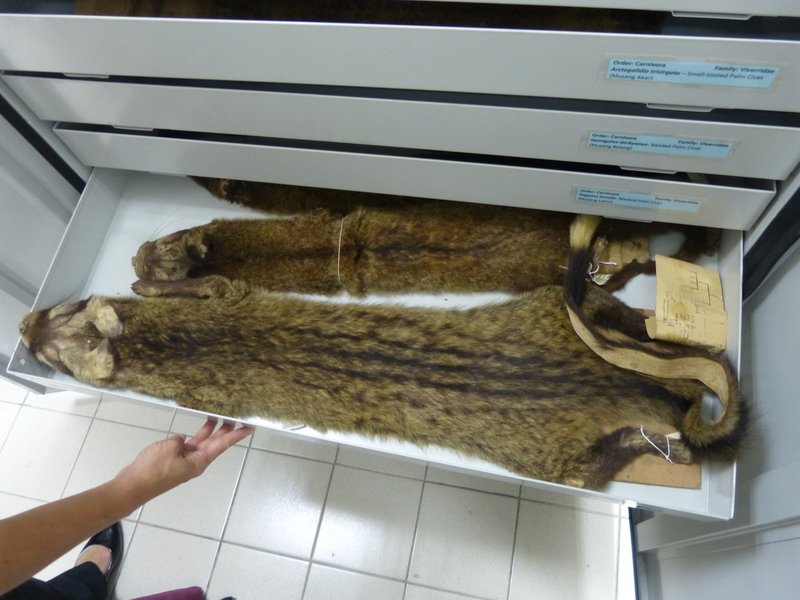 While we were at University of Malaya, we took the opportunity to visit their Museum of Zoology and we were hosted by their friendly museum staff – Thary and Khairunnisa who kindly took us on a guided tour. On the last day of the congress, we had a short field trip to Taman Wetlands at Putrajaya and the Putra Mosque. 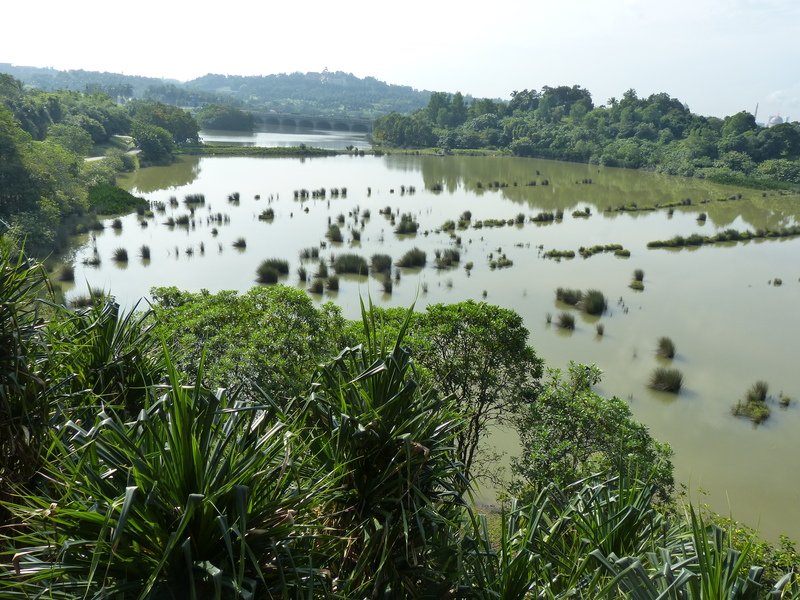 We wished we had more time to explore Taman Wetlands! The congress provided a great opportunity for us to learn from the diversity of research topics that were presented and it definitely served as an excellent platform for us to share about our research work. The next BSGC will be hosted by NUS and graduate students should not miss this opportunity to present your research and to make friends with like-minded people! Deforestation in Asia is progressing at a faster rate than any other tropical area, reducing natural forest cover to its lowest level in the Quaternary Period. A variety of modern technologies have been developed that can accelerate and invigorate conservation. This course will focus on how nascent techniques can be used to monitor change in habitats and biodiversity. We will investigate technological and analytical advances in tropical conservation before developing a group project to implement these methods to monitor species richness or biotic interactions. We expect that group projects will result in at least one multi-authored publication. The course will consist of two parts: an online lecture/discussion course in Spring 2014 and a four week field course in June 2014 at the Xishuangbanna Tropical Botanical Garden (XTBG) in Yunnan, China, a research institute in the Chinese Academy of Sciences. All travel and accommodation expenses will be paid for 18 graduate students from any graduate degree granting institution in the U.S.A. or tropical Asia, funded by the US National Science Foundation. An additional 12 mainland Chinese graduate students will be funded by the Chinese National Science Foundation. Students will watch lecture videos online prior to participating in a guided discussion that will meet online once a week in Spring 2014 (February – May). Students will form partnerships with classmates and perform research projects on specific regions of the Asian tropics. Given the ease of web-based global communication, the students will be expected to develop proficiency in communicating with peers across technological, geographical, and cultural boundaries. Guest lecturers for the course include Richard CORLETT (XTBG), Rhett HARRISON (Kunming Institute of Botany), Erik MEIJAARD (People and Nature Consulting), Douglas SHEIL (Director, Institute of Tropical Forest Conservation), Cam WEBB (Arnold Arboretum/Harvard), and Jianchu XU (Chief Scientific Officer, ICRAF/China). The Xishuangbanna Tropical Botanical Garden (http://english.xtbg.cas.cn) has been performing scientific research and providing agro-forestry outreach and training for over 50 years in the remote southwestern corner of China, near the borders of Laos and Myanmar. With an active community of international scientists and graduate students, XTBG is a leading ecological and botanical research institute in the Chinese Academy of Sciences. All students enrolled in the course will travel to XTBG in June 2014 to participate in field training, taxon-specific survey techniques, and to complete one or more group projects.